Though LXDE team doesn’t have any artists, we still spend time focusing on the decoration stuffs. It’s prety cool! Just look our new wallpapers! So far LXNM(Network Manager of LXDE) was in prototype, LXDE team was just trying to implement a usable network utility. In the beginning, it was expected be enough to work instead of Network Manager of GNOME. But even today, most of people still uses LXDE desktop environment without LXNM due to it is so buggy and poor. Also LXNM has no more improvements in the past, it seems to die for a long time. In principle LXNM will keep original features and most of architecture, but for more requirements of networking device operations, it will be modified or re-designed some parts of that, For communication of Client/Server, LXNM protocol will be re-defined to support more features that something’s just like response of networking status, it means that in the future user can get more complete informations of networking in a moment, and also fixed a critical bug that netstat plugin of LXPanele cannot found out any wireless Access Point as non-root. 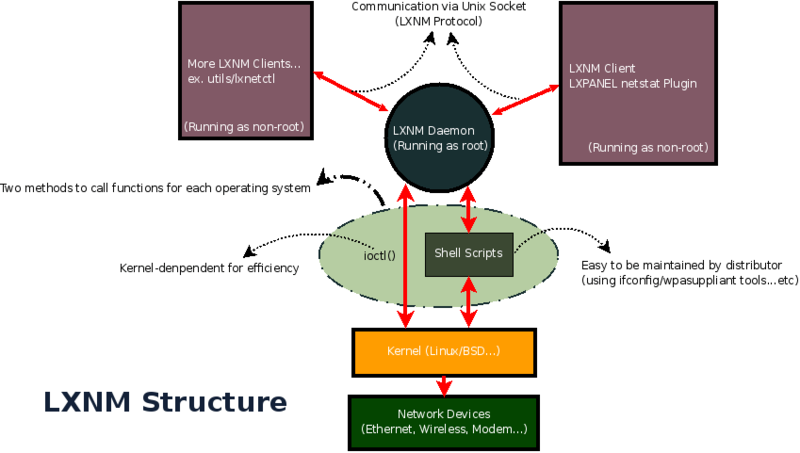 For easy to migrate to other platform which is other linux distribution or other Unix-like operating system, LXNM still keep script-based method to handle network device control. Considering that efficiency issue, LXNM will provide a new way to implement that direct call system call to operate network device for each operating system in C language without any scripts, this feature needs more time to be done due to it’s harder and more complicated than script-based method. With the Google Summer of Code 2009, LXNM is restarting right now. We expect that LXNM will have a great usable version after three month in the future. My friend Kevin, who is based in Ho-Chi-Minh-City (former Saigon), has written a nice article about his experience with LXDE and Sidux on his blog Saigonnezumi.com. The post can be used as a how to for anyone who wants to try out LXDE on Sidux. Actually, the LXDE (Lightweight X11 Desktop Environment) project had rested for some time. Though we’re getting more and more people to join us since Linux World Expo 2008, LXDE have no much improvements since July this year. It’s happened due to our main developers didn’t have time to write new code, PCMan took time to focuses on his physician jobs, Jserv has worked for a new project which is confidential. About me, I was burdened with my family, so I also need to focus on my current jobs and my school to earn more money. Recently, we’re planning to release a new version and new stuffs of some LXDE components for Merry Christmas. 😀 It is a great news that LXDE has a new project – “menu-cache”, which is a library creating and utilizing caches to speed up the manipulation for freedesktop.org defined application menus, and also it can be used as a replacement of libgnome-menu of gnome-menus. It means the menu-cache will speed up our LXLauncher and LXPanel menu, they will be getting faster. for supporting the menu-cache, PCMan is working hard on LXPanel right now, you can see logs of SVN everyday. Besides, we hope to release a lxpanel-dev package for development of lxpanel plugin next version. Currently, it is difficult to write a new plugin for lxpanel, if you wanna write a new one, you have to download the LXPanel sourcecode and inject your code into the LXPanel and then copy the .so file to the system folder after compile it successful. It doesn’t make sense that is too complicated for developing a plugin. So we are tring to export header files and pkgconfig for making easy for development of plugin. Additionally, LXPanel has been reformed, lxpanel-core and lxpanel-plugin be separated. It will be helpful to maintain LXPanel sourcecode for us. Well, I wanna make an apology for all of patch provider right now, because you guys’ patches which wasn’t applied for a long time. We are reviewing those patches currently, it will be applied as soon as possible, I hope so.